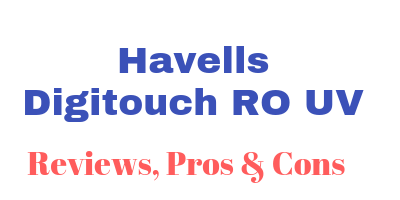 If you are looking for Havells digitouch RO UV review then I must say you are at the right place. In this article I am going to show you all the details about this water purifier. I have also listed the pros and cons of this water purifier as well. If you are looking for a stylish water purifier with a solid water purification system then havells digitouch 7 litre RO UV water purifier is ideal for you. This is a high end water purifier and it is fully automatic. It comes with a solid 8 stage water purification system. It also have some additional features like i-protect purification, smart programmable dispensing options, digital clock etc. This water purifier have a very modern look. The build quality of this water purifier is also very good. It has a very premium styling and digital interface which adds to its modern look. It also comes with smart touch interface which basically is a fancy name for its touch screen buttons which you can use for dispensing water. Talking about dispensing water, this water purifier comes with 3 smart programmable dispensing options. The dispensing options are as follows. Free flow- when you choose this option the water purifier will dispense water until you stop the dispensing manually. This water purifier requires electricity even for dispensing water so during power outcuts you cannot dispense water, if you don’t have inverter or any similar arrangement for electricity. Around The panel there is lighting which represents different stages of water purification. Amber light indicates that the double UV purification process is going on in the water purifier. This lighting really adds to its modern look. This is a wall mountable water purifier and you can use it as table top as well. Havells digitouch has RO UV water purification and it completes its water purification in 8 stages. Now let’s have a closer look to each of its stage and its filters. The first stage of water purification is consists of Membrane Performance Enhancer which, as the name suggests, helps to improve the performance of all the membranes which will come after this water purification stage. The second stage of purification is consist of sediment cartridge which removes the physical or visible impurities likes sand, mud, dust etc from the water. The third stage of purification is consist of activated carbon cartridge which removes bad smell and odour causing contaminants from the water. The Fourth stage of water purification is consist of RO membrane. The water is passed with a great fall through this RO membrane which allows water molecules only to pass through it and blocks all the dissolved salts and solids from the water. Ultimately converting hard water into soft water. Fifth stage of water purification is consist of germicidal UV chamber. At this stage the water is exposed to the UV rays of the UV bulb which inactivates harmful bacteria, viruses and protozoa from the water making the water microbes free. 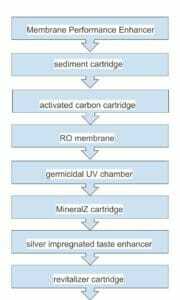 The 6th stage of water purification is consist of MineralZ cartridge. It maintains the pH of the water according to the the source of the water automatically. This basically helps to retain the essential natural minerals in the water which makes the water healthy and tasty. The seventh stage of water purification is consist of silver impregnated taste enhancer. As the name suggest, it basically helps to improve the taste of the water and it also removes remaining impurities from the water. The 8th stage of water purification is consist of revitalizer cartridge. This cartridge restructures the water molecules and makes it biologically active that improves the hydration and mineral absorption for your body. It basically makes sure that you will get most out of the water you are drinking. This water purifier keeps the water in flow after every 4 hours. And it also performs UV water purification after every 4 hours which basically gives you safe and fresh water and it also helps to enhance the oxygen level in the purified water. Also it helps to maintain the hygiene in the water storage tank. It also comes with iprotect water purification monitoring which cuts of the water if it is no longer safe for drinking. With 8 stage water purification and UV purification havells digitouch have a very solid water purification systems. The water tank also comes with ingress protection cover which basically stops external invasion of insects and dust particles in the water storage tank. The alert system of havells digitouch is pretty good and it has all the essential indicators that a water purifier should have. It comes with backlit LED indicators. As the name suggests, it will alert you whenever the water purifier will require maintenance. As the name suggests, it will show you the cartridge life of filter so that you can plan its maintenance before hand. Havells digitouch RO UV comes with digital clock under touch panel. This feature basically monitors the performance of the vital components such as the pump, cartridges and make sure that they are performing properly or else it will display error on the torch panel. Over all users are pretty happy with the performance and look of this water purifier. Havells digitouch comes with one year warranty. If you are looking for a stylish and modern looking water purifier then Havells Digitouch RO UV is a good choice for you. It also comes with a touch panel and backlit which really adds to its modern look. This water purifier comes with a RO and UV water purification. It is a high end water purifier and it has a very good 8 stage water purification system. Additionally it comes with some good extra features such as 3 smart programmable dispensing options, iprotect purification and digital clock. It also has good alert system. It will notify you whenever there will be any error or the water purifier review required maintenance. It also shows you life of cartridge on its touch panel. I hope you found this Havells Digitouch RO UV review helpful. Q. Which water purification Technology does Havells Digitouch have? A. Havells digitouch comes with RO and UV water purification Technologies. A. Havells digitouch comes with 8 stage water purification and it has one filter at each stage. Q. What is double UV purification? A. Havells digitouch comes with double UV purification. It basically means that the water purifier will automatically double purify the water after every 4 hours with UV purification. This water purifier keeps the water in the flow after every 4 hours and the water is passed through through UV chamber for UV purification. It basically helps to keep the water fresh and also it increases the oxygen in the water as well as it helps to keep the water tank hygienic. Q. What is the power of the UV bulb? Q. What is the life of the RO membrane? A. It is highly depends upon the quality of the water it is going to purify. For example, the membrane will last relatively less time, if it have to purify water of 1500 PPM than purifying water having TDS of 800 PPM. Q. How much time does it take to fill the water storage tank fully? A. It really depends upon the the quality of the water And the life of the membrane. For example, it will take more time to fill the water storage tank if the TDS of the water is 1500 PPM than water having TDS of 800 PPM. Also the membrane life can affect the time for filling the water storage tank. For example, it will purifier water fast when the membrane is new and as the time passes the time for filling the water storage tank will increase. This is an automatic water purifier so you don’t have to manually switch on or switch off it. It will automatically purify the water and it will automatically shut down the water purification once the water storage tank is fully filled. Also it will also automatically start the water purification process once the water level in the storage tank decreases. Q. What is the limit of the TDS of the water it can purify? Q. Does it cools the water? A. No. It just purifies the water. Q. After how much time do we have to change the filters all this water purifier? A. It highly depends on the quality and quantity of water it purifies. Usually you have to change its filters annually. Q. Does it have Steel or plastic water storage tank? A. Its water storage tank is made from Food grade plastic which is non-toxic and durable as well. Q. How to dispense water from this water purifier? A. This water purifier does not comes with a normal tap for dispensing water. Instead it has 3 buttons or three options for dispensing water. Glass- when you choose this option the water purifier will dispense the water only enough for filling a glass of water. Free flow- when you choose this option the water purifier will dispense water continuously until you switch off the flow manually. Q. Does it require electricity even for dispensing water? A. 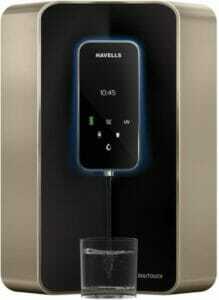 Yes Havells digitouch is a fully automatic water purifier and it even requires electricity for dispensing water. It can cause problems during power outcuts. If you have inverter or any kind of other electricity arrangements then it can easily dispense water. Q. Will it work on inverter? A. Yes, it is a fully automatic water purifier and it requires electricity even for dispensing so if you have inverter it will dispense water during power during power outcuts. Q. Will this water purifier notify me whenever it require maintenance? A. Yes, this water purifier comes with a maintenance alert indicator on its touch panel and it will notify you whenever there will be any error in the water purification process or when the water purifier required maintenance. Q. Does it comes with TDS controller? A. No, this water purifier doesn’t come with TDS controller instead it has Mineralz cartridge, which basically do the same job as a TDS controller does. The minerals cartridge basically adjust the pH value of the water according to the source of the water, which helps in retaining the essential natural minerals found in water which is the same job TDS controller does. With TDS controller you will have to manually adjust the TDS of the water but with Mineralz cartridge it will automatically adjust the pH of the water. Q. Does this water purifier can purify water from Municipal water supply? A. Yes, this water purifier Kent purifier water from Municipal water supply. Usually Water from the municipal water supply have low TDS and this water purifier is a RO water purifier and it basically removes TDS from the water. Water having very low TDS level is also not good for health because such water lacks the essential natural minerals. But this water purifier comes with minerals cartridge which helps to retain the essential natural minerals by maintaining the pH value of the water according to the source of the water. Q. Does this water purifier can purify water from borewell or well? A. Yes, it can purify water from both the sources and it also comes with Mineralz cartridge which helps to retain the essential natural minerals in the water. Q. Does this water purifier comes with hot water option or cool water option? A. No, this water purifier does not have those options it only purifies the water. A. No, this water purifier does not comes with pre filter and it also does not require pre filter because it comes with Membrane Performance Enhancer at the first stage of water purification which basically works the same way as pre filter does. Q. What is the annual maintenance cost of these water purifier? Q. Is this water purifier wall mountable or table top? A. This is a wall mountable water purifier and you can also use it as table top. Q. What is the warranty of this water purifier? A. This water purifier comes with 1 year warranty. Q. What is the water storage capacity of this water purifier? A. This water purifier comes with 7 litre water storage tank which is made from Food grade plastic which is non-toxic and durable as well.